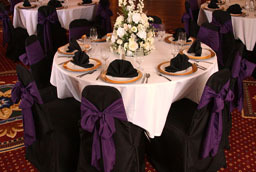 Myers Catering & Decorating is a full service catering company at a venue of your choice. 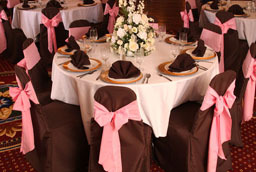 We have been serving the Tri-State Area since 1991, and offer casual to elegant functions with fair pricing. We use only the finest and freshest ingredients, and are dedicated to excellence in our food quality, preparation, and presentation. Thank you for considering Myers Catering & Decorating. The Hopwood Social Hall is an all inclusive banquet hall for parties and weddings in elegant and romantic surroundings, with seating for a minimum of 250, and maximum of 550. When you book a Friday or Sunday function you will receive a $6.00 per person discount and the minimum is 200 people. . .
We are an all inclusive banquet hall for parties and wedding in elegant and formal surroundings, our minimum for party is 30 to 150. . .
for any location. The cost of $3.00 includes: placement and removal of chaircover & sash for each chair. 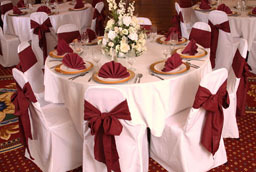 Click here to view all available colors including: chaircovers, sashes, & napkins.